VIENNA - ENGR. 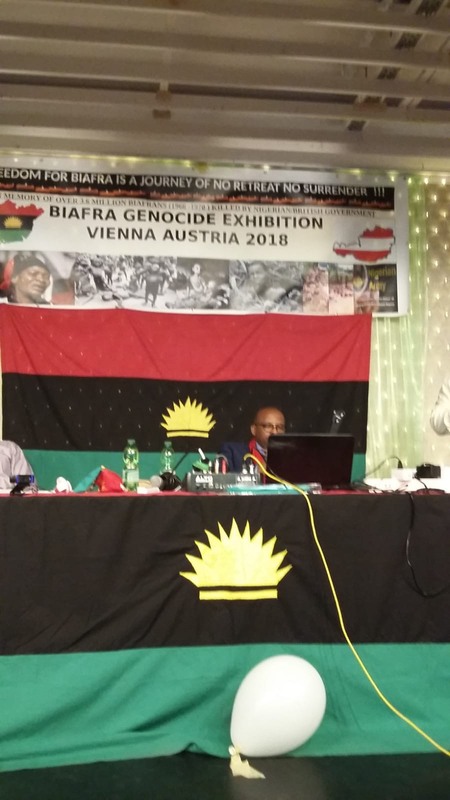 Michael Chijioke Umeh, the zonal coordinator of the Indigenous People of Biafra, IPOB, in Vienna has described the Nigerian state ‘as a killer of dreams, a company and a dean of corruption,’ which has been in the business of deceiving its citizens. Umeh made this declaration in a keynote address presented by him during the just-concluded Biafra Genocide Exhibition in Vienna, Austria which was witnessed by IPOB’s Deputy Leader, Mr Alphonsus Uche-Mefor, Head of Directorate of State, Mr Chika Edoziem, Head of Finance, Mrs Nnennaya Anya and other top members of IPOB in the diaspora. The coordinator who called on the attention of the international community to prevail on both the British and Nigerian governments to end the killings of Biafrans in Nigeria, stated that as a ‘jungle’, Biafrans has no hope nor future in the Nigerian enclave, hence their call for total emancipation through the conduct of a free, fair and credible referendum vote. He added that the emergence of Biafra as a nation would go a long way in solving the immigration crises that has posed a threat to most European countries of the world, saying that Biafra would stand as an exemplary nation worthy of emulation by most African countries. “We thank Chiukwuokikeabiama for keeping us alive to speak and bear witness to atrocities and killings being perpetrated on the Indigenous People of Biafra. Over 3.5 million Biafran men, women and children were murdered between 1967-1970 in a war of annihilation by Britain and Nigeria, even till date, thousands of our men, women and children are still being kidnapped and killed on daily basis. “We are putting the humanity on notice to advice the British-Nigeria government to stop these killings on Biafrans, we Biafrans are calling on the international community to help and support us on the challenges we are facing, to support our Biafra Referendum to enable us to restore our stolen nation, Biafra. “Nigeria is a killer, a company not a country, a place where rodents pursued a sitting (rigged-in) president out of the government Villa; a place where monkeys and snakes (steal) swallow money and till date nothing has been heard after the government made the pronunciations if the snake or the monkeys has been arrested or not. “Nigeria is a dean of corruption. A country that deceives it’s citizens, We Biafrans has no future in such jungle, this is the reason we are calling on the international community to support the liberty and freedom for Biafra to enable us to emerge as an independent nation. Transparency and honesty is all we need. Emergence of a Biafra nation will help to solve the problem of immigration, because then Biafra will be a model that would inspire other African nations,” Umeh stated. “We want to thank our supreme leader, Mazi Nnamdi Kanu whom God has sent in our time to come and lead his people out of slavery and to the promised land Biafra. A man that opened our eyes to the realities and the truth, a man that united all the children of God from all corners of the earth. A prophet. The man that gave us a platform to speak and interact. A man that created an opportunity for us all (Biafra) to re-write our names, and the names of our towns and villages in a good note. To this you will now ask yourself what positive contribution have you made or stamped in this struggle. Or would you tow the line of Ifeajuna? How do Biafrans react when your names are being mentioned? He also spared no moment in admonishing those he described as Biafra saboteurs, asking them to turn a new leaf as it is not yet late to make genuine amends. “Today we are here in this hall for the Biafra Genocide Exhibition but there are other Biafrans in a hall somewhere celebrating Zoo (Nigeria’s) independence. 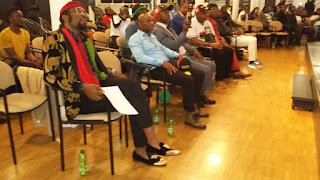 Some leaders of some states in Biafraland and some acclaimed veterans are not left out, but when Biafra will be restored you will hear some of them or trying to take a glory of what they did not do in the restoration of Biafra here in Austria or other countries as the case may be. But thanks to our leader, Mazi Nnamdi Kanu that opened our eyes and brains to reason further and to document at same time, they will no longer deceive us again. Umeh also rendered his unreserved appreciation to IPOB family worldwide, her leaders and the various media departments and journalists working assiduously for the restoration of Biafra. “We appreciate all true Biafrans and veterans present with us here today. And to some Biafrans that have not keyed to this restoration journey or sabotaging the struggle, we say retrace your bad steps, it is not yet late, please join the IPOB family lead by Mazi Nnamdi Kanu and work for the restoration of Biafra in truth and honesty for Biafra is our last hope. Live a life in this struggle that will make a woman that delivered a baby wanting to name her child after your name. This will be a witness and a good testimony. Join IPOB family in your area and contribute positively, pay your dues, attend meetings and be loyal to IPOB leadership. “Biafrans are exceptional people, our flag says it all, we bring light where there is darkness – a Rising Sun placed on the position of a black strip. Be always light not darkness and never allow devil to take this good quality away from you in this Biafra restoration struggle. “We want to thank in a special way the Radio Biafra London, Facebook admin, Family writers and all Biafra media journalists, all Radio Biafra London (Sister Stations) and Television Broadcasters. 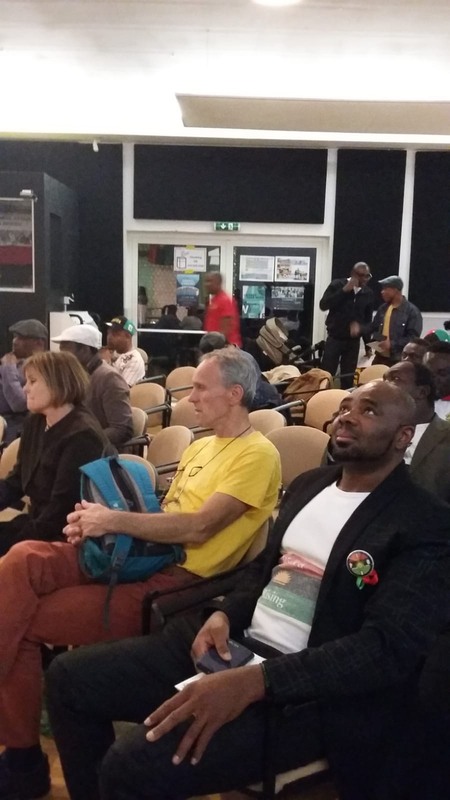 We the Indigenous People of Biafra in Austria is thanking you all for the wonderful work you people does for Biafra and for the wider publicity you all gave to this Genocide Exhibition. We will never fail to thank every Biafra who in his or her private live broadcast did justice to the publicity of this Genocide exhibition. And the Biafra struggle. May Chiukwuokike bless you all and grant us Biafra.